My husband had the day off today so i decided to make the most of it, extending the blogging spree i have been on. With the onset of winter and beginning of the apple season, the vegetable markets near my place are flooded with all kinds of apples. I saw lovely green apples when i visited the store the other day and instantly my hand reached out for it. This time i decided to make something with it instead of devouring the raw fruit. I kept vacillating between green apple pickle and green apple rings. After much thought i decided to reserve pickle making for another day. Green apple rings are extremely simple to make and yummy. Here goes the recipe for this tea time snack. Core the apple and slice it horizontally to make apple rings. Make a thick batter with flour, rice flour/corn flour, sugar, cinnamon powder and water. Dip the apple rings in the batter and ensure that the batter is coated well around the rings. Deep fry the apple rings till golden brown. Drizzle maple syrup or butter lite syrup over the rings and serve hot!! 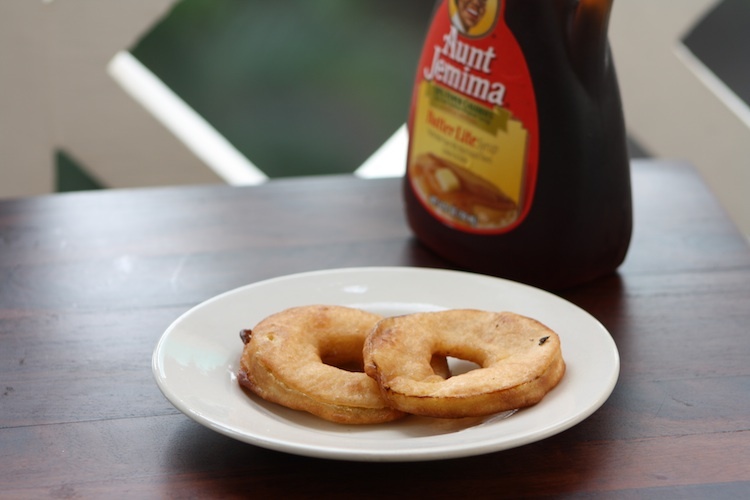 Looks yummy…do you get Aunt Jemima here?